From 1949, the Argylls were stationed in Hong Kong. In June 1950, I was lucky enough, along with two other Argylls, to have our names drawn from a hat to sail with the Navy to Kure in Japan in order to be present at the annual Naval Regatta held there - a supposed holiday. The three of us, along with representatives of other regiments, boarded HMS Jamaica a six-inch gun light cruiser while other troops boarded a sloop, HMS Black Swan. Before reaching Japan the Korean war started and the ships were diverted to support United Nations forces in Korea, to bombard the North Korean coastal supply routes, various military installations, convoys of lorries, tanks and guns along with anything else needing attention. Having been locked below decks during the first action, we presented ourselves smartly to the Gunnery Officer as soon as action stations were ended and begged to be on deck next time to help in any way possible. We did not want to be enclosed in a steel tomb, or so it seemed to soldiers. We were all appointed to pass ammunition to the 4-inch guns (ship's secondary armament), Bofors and multiple pom-pom guns. We, the Black Swan and an American anti-aircraft cruiser, were attacked on one occasion by eight Korean motor torpedo boats. The ensuing fight was great to watch, as huge 6-inch gun broadsides (very noisy) being fired into the water caused massive waves. This was to create columns of water in front of the MTBs with the object being that they would run into the wall of water and sink, which several did - hitting a small boat doing 40 knots was otherwise very difficult. By the end of the action seven had been sunk or disabled and one beached itself, the crew running away whilst we blasted their abandoned MTB to pieces. On another occasion we were bombarding a convoy including artillery pieces. They were firing back when an unlucky shell hit the mast just above our heads and burst showering the troops and sailors on the other side of the ship with shrapnel, killing and wounding five or six men. Again we were lucky, but one Argyll got a tiny splinter in his wrist and from this action he could claim to be the first Argyll casualty in the Korean War. We eventually left the ship at Nagasaki and had a two-day train ride from the South Island to North Island, and much of the country looked like Scotland. We arrived at Kure Naval Base where the Japanese Fleet sailed from when they attacked Pearl Harbour. We visited Hiroshima and Nagasaki while we waited for transport back to Hong Kong, eventually boarding HMS Ocean, an aircraft carrier that was being used as supply ship between Singapore and Japan/Korea. Around that time The United Nations / Americans wrote to the British, "For God's Sake send us something!" We were later jokingly known as the 'For God's Sake send us some thing Brigade'. So the Argylls sailed from Hong Kong on the 24th August 1950, aboard a 6-inch gun light cruiser HMS Ceylon to join the United Nations forces as part of 27 Brigade, which included the Middlesex Regiment, ourselves and not much else - we did not even have our transport. I had been born in Ceylon on the 30th June 1929, which was at least for me a good omen and that is what it turned out to be, as I came through the nine-month campaign unscathed. We landed at Pusan in South Korea to be greeted by a hysterical, noisy welcome from the Koreans and an American band of some doubtful ability as musicians, but certainly not lacking in enthusiasm. The Argylls disembarked and entrained, but there was much difficulty keeping the sailors from joining us and at least one sailor was found by the naval police hiding under a seat - they wanted to join their army friends. As I remember it, the journey to the front line was not far, but took rather a long time due to the unwillingness of the engine driver to go more than short distances and then go to sleep. He eventually had to be forcibly made to continue by an officer standing with a drawn gun to persuade him. At the end we finished up in an apple orchard, with the most delicious apples that could be picked from where we slept on the ground. The next morning everyone who had eaten the apples had upset stomachs and it was discovered by our Medical Officer that the apples had been sprayed with arsenic against insects - removal of the powder relieved the problem.This was a short break before business began. Our first position was on a hill beside the Naktong River, which overlooked a road running alongside the river. The enemy (Gooks as they became known) were on the other side of the river well within small arms (rifle and machine gun) range. Our arrival at this point was to take over from an American unit. At the dead of night my unit, 'C' Company, reached this position by a somewhat circuitous, dangerous and not recommended route - we had got ourselves lost. By moving down no-man's-land along the road between the Americans and Gooks (North Koreans) who held positions over the river, we were in considerable danger from both sides. This was all something we did not realise fully until later (what price the fog of war) and was done with considerable luck and all without attracting the enemy who were some two/three hundred yards away. We eventually found where we should be. The Argylls, who were keeping quiet as is normal, were suddenly met by the Americans - all hell let loose with great welcome greetings being shouted mainly by the black American troops who made up the majority of the unit. The object was not to let the enemy know what was going on and the greeting certainly frightened the Argylls who did not usually conduct war in this way. Soon we were to discover that American combat units (equivalent to our battalions) were in many cases a very undisciplined lot, but their Airborne, Marines and some combat units were excellent. One American was heard to call in a loud voice, down into a dip in the ground, "Who dat down there?" and the reply, "Who dat up there calling who dat down there?" The enemy must have heard this, as they machine-gunned in our general direction and the Americans left rapidly. Our platoon and one other took up positions at the top of the hill, while another platoon took up positions at a location nearer the bottom. There was much patrolling and good deal of exchange of fire. One patrol lost two dead, with Captain Neil Buchanan and his batman both badly wounded, managing to bravely give covering fire to allow the rest of the patrol to withdraw with several wounded. During the next two nights the 'Gooks' sent patrols against our Vickers machine guns within the lower platoon's position. They wounded some men on the first night, but on the second night when they returned just before dawn no one fired until the light grew stronger. Then the sergeant ordered them to fire and the 'Gooks' lost ten dead and several more were seen to be wounded. This was all teaching us about the 'Gook' and was to stand us in good stead for the future. After some two weeks we were relieved. Next started what was to be very much the story of Korea; climbing in trucks, travelling with tanks as escorts, moving forward and clearing locations of enemy and then on again. Shortly after the UN Forces started to move forward we came to a range of hills running each side of the road and the enemy fired on our convoy. Brigadier Coad ordered the Middlesex troops to clear the smaller hill to the right, which they did with great dash. Argyll 'A' Company took up a position on a smaller hill at the bottom of Hill 282 and as there was insufficient light 'B' & 'C' Companies took 'lying up' positions in front of 'A' Company and bedded down on the ground for the night. I doubt many slept, as this was our first dawn attack and all were naturally very apprehensive of what was expected to happen, wondering whether we would be found wanting and how would we acquit ourselves. The question that ran through my mind, and I am sure the minds of others, was how many 'Gooks' were up there and what was going to happen. Would you be wounded or killed? It never got better with each attack, but the first going into the unknown was the worst - thereafter it was no longer not the unknown, but rather what you had experienced before. Each assault was always a different situation and always full of the unexpected - this was, to put it mildly, somewhat nerve racking. Just before dawn on a dry day, we were told to prepare ourselves and to leave our heavy gear and blankets where they were and just take our water bottles, weapons, and ammunition. A hasty breakfast on cold American 'C' rations - a cardboard box with a black substance between two layers of brown cardboard that burnt very well with no smoke to heat cans of food delivered daily. Each box consisted of three main meal cans, 20 cigarettes, coffee sachets, coca slab (marvellous), two small cans of fruit salad or similar. We formed up with 'B' Company on the right and 'C' Company on the left. Each company was to climb up through dense fir woods on two separate spurs leading to the top. The command to advance was given at 5.15am and we moved off, our platoon being in the lead for 'C' Company. Every tree and mound you felt may hold 'Gooks' ready to fire, which was a time of high nervous tension and natural fear. We heard firing from 'B' Company who had pulled ahead of us and had surprised a breakfast party of 'Gooks'. Soon after we came on unmanned enemy trenches. By now there was a lot of firing and some mortaring all around the area. We arrived at the top and met up with 'B' Company. No 7 Platoon, of 'B' Company, under the command of Lieutenant Jock Edington, was engaging the enemy in a large fire fight in the woods to the left, which turned out to be only half of the hill, which was a surprise to us all. This area latterly was found to contain a 'Gook' observation post that was controlling their mortars. Our platoon was told to hold a position immediately below the top ridge as a reserve but we were soon under fire from the enemy who were working their way round the hard pressed 7 Platoon who had done sterling work against a numerically superior enemy. 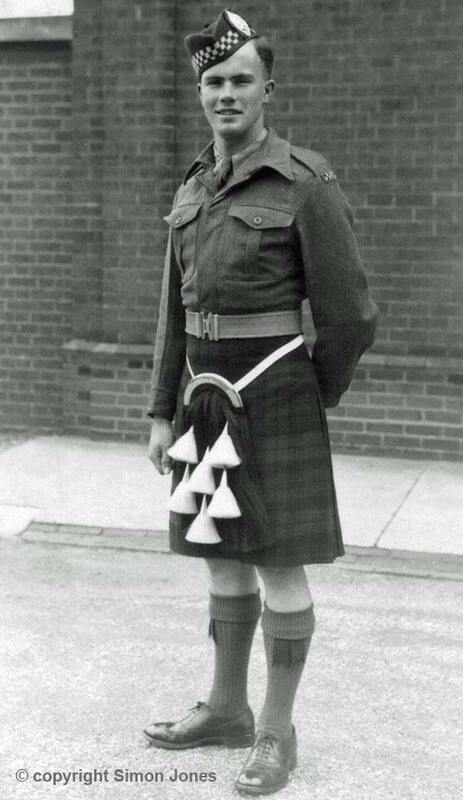 The Argylls killed many, but eventually had to retire despite being reinforced by Lieutenant Buchanan's platoon. Both platoon commanders were badly wounded: Lieutenant Buchanan was subsequently killed with other wounded when American planes dropped napalm on us. Things were getting bad with a considerable number of wounded and killed when Major Muir, the Battalion 2i/c arrived with a party, some from the Middlesex Regiment, carrying stretchers loaded with ammunition. They were to try and evacuate the wounded. The Americans had withdrawn their artillery support from us, as they said there were no enemy on the Hill. Because of the height of the hill, some 900ft, our 3" mortars could not reach the enemy over our position from where they were located. Our Vickers machine guns were with 'A' Company and could not fire over the hill, although they did give covering fire into the woods where the enemy were infiltrating round our left flank. Without support from artillery or mortars our Commanding Officer, Lieutenant Colonel Neilson, called in the American Air Force to attack the 'Gooks'. In the middle of our position we laid out our florescent aircraft recognition panels in the correct code for the day - these panels were used to warn planes on the whereabouts of UN troops. We heard the planes, US propeller-driven Mustangs, arrive and hopes ran high but instead of hitting the 'Gooks' they dropped napalm on us killing some of our wounded and severely burning others. Many had to try and escape the wall of fire by running from the position. Our location was fortunately on a mound and burning petrol and oil went down the gully within 30 feet of us - we were singed from the heat. The planes came back machine-gunning our position. There was naturally tremendous shock, despair and anger with frantic attempts to get the correct Veri-Light flare to stop them. The signaller had been killed, so I and another Argyll were desperately trying to find the correct Veri-Light flare, which was in the dead soldiers haversack, firing this would stop the attack. Finally we found the correct red flare and as one of the American Mustangs came in strafing we fired the flare, which he saw. 'A' Company was also being machine-gunned and they were firing Veri-Lights. Major Muir was still on the Hill and gathered the few remaining unhurt men of whom I was one. He led the charge to the crest where one remaining Argyll, Private Watts, with one or two others, was still holding and defending the position - the Battalion History says there were only fourteen of us. The enemy was late in taking advantage, but had by this time realised what had happened and came charging up the Hill. I was near Major Muir on his right while he and I think his Batman manned and fired a 2" mortar from Major Muir's hip. They were sitting on the top of the crest in full view of the enemy under heavy machine gun fire. I was firing at the 'Gooks' as they advanced with all the few Argylls remaining doing the same and we had only two Bren guns left. Major Muir was leading a charmed life it seemed, but was soon hit by two bursts of machine gun fire and mortally wounded. He had to be carried off the Hill, and died upon reaching the bottom. As conditions were so bad and casualties so high the CO gave Major Gordon Ingram, 'B' Company commander, permission to withdraw the remainder of both companies and we moved off firing as we went. The enemy, by this time, had reached the top of the Hill and were firing at us. One 'Gook' was after me as he placed a round each side of my head, luckily missing. It must have been my lucky day, as earlier two machine gun bursts came within 12" each side of me and I made a very hasty drop into a deserted 'Gook' foxhole having also escaped the earlier napalm. One Argyll, while trying to retire, was attacked by three 'Gooks' - he bayoneted one and took his Burp gun (Chinese machine gun) and killed the other two, and he then escaped. Almost all were carrying wounded or extra weapons to deny these from the enemy. No doubt due to the severe fighting, the enemy did not pursue us and we reached the bottom of the Hill safely. We returned to 'A' Company's position unbowed, yet sadly a much smaller number than that which had left in the morning, having suffered some 90 plus casualties with 13 dead out of a total of some 180 from the two companies assembled that morning. I saw Major Muir's body at the bottom of the Hill where he had been left when he died and he later was awarded a Posthumous VC. We were under strength, as we had left Hong Kong with only three companies instead of four but after Hill 282 we were down to just two companies in the Battalion until reinforcements eventually arrived. Just before dark I led some of the remaining men to collect blankets and ponchos from where we had left them in the morning at the bottom of the Hill. Men who had been carrying stretchers and had been driven down by the flames were starting to drift back to our position. Some days later we had our packs brought up to us and we were told to take anyone's pack, I walked over and there was my own pack. We had not shaved or washed for several days, so to have one's own pack returned was especially welcome. We heard, rightly or wrongly, that the American pilots, before attacking, had radioed their base to say there were fluorescent panels on the ground in the correct code of the day. Their base said that there were no UN troops on the Hill and that the enemy were using captured panels - they ordered them to attack; hence we were hit instead of the enemy. The American pilots visited the wounded in hospital and were most upset about what had been done - the fog of war rears its ugly head again. After Hill 282 we had a few days break from rushing around, though we were still near the front line when our reinforcements arrived from the UK, quite a few of whom were volunteers from other regiments but keen as mustard to join what they thought was an elite unit. What price the notoriety and press coverage of Hill 282? They soon realised we were just a normal Scottish battalion doing an unpleasant task as best we could. Around the end of September our transport caught up with us and once again the advance continued daily until the end of October. We were joined by an Australian battalion and later New Zealand 25- pounder gunners, Indian Paras, Field Ambulance unit and Colonel Snow's American unit of 4.2" mortars. This Commonwealth 27th Brigade was later joined by two Canadian battalions. Our advances were made in convoys of lorries with tanks, or in set piece assaults with one battalion passing through the other day after day. The Korean Peninsula has large ranges of hills running across it, instead of up and down the peninsula, thus making very hard work of the advance. One battalion would attack one hill range one day and then the other would pass through the next day and so on. We had the Australian battalion supporting us, and they were superb fighters that loved a scrap, and the Canadians partnered the Middlesex. The Brigade was moved by air and road to north of Seoul. I was lucky to fly and we were loaded on to American Sky Master troop/cargo planes. The American Load Master handed us each a parachute, showed us how to wear it and simply said if the plane gets hit jump out and say 1000, 2000, 3000 and then pull the ripcord. This was greeted with usual Jock remarks that are unprintable, false bravado and with some prayers that we would not have to try this urgent way to earth. Luckily all went well and we landed safely. The Brigade moved forward and crossed the 38th parallel after the Americans had had a vicious battle to capture it. Rumours abounded and many said that the Argylls and Middlesex would be sent back to Hong Kong for Christmas. We were all very poorly equipped, having come from Hong Kong in tropical clothing, having been intended as a stopgap until the much-heralded 29th Brigade arrived from the UK. This of course turned out to be false and both brigades remained in Korea. After various moves forward heading north, the battalion 'spearheading' entered Sariwon, the North Korean's Aldershot. 'A' Company led the way and had a good firefight, assisted by Sherman tanks, and soon had the enemy on the run. I remember advancing with 'C' Company, in the usual freezing conditions, through the so-called high street with men each side of the road. We got out to the far end of the town and waited while the Australians moved through us. Next we were told to move back to the south side of the town. As we moved south on each side of the street, other men were found to be moving north in the centre of the street. To our horror we realised that these were North Koreans but for a while every one kept very quiet and moved along very much on the alert. The Koreans thought that we were Russians arriving to help them and even gave our mortar platoon officer, Robin Fairrie, a Korean comfort girl in his jeep. We heard it was an American tank commander when being asked if he was Russian who said, "Hell no, we are Americans". All hell broke loose for a few seconds and then strangely we went on passing each other, they in the centre of the road and us each side of the road. The Koreans went north to be met by the Australians who killed many of them - one Korean had a full magazine (30 rounds of 303 Bren gun ammunition) in him and still was only just stopped but lived for a long time. We moved back into a secured area for the night and then continued the advance in the morning through the Aussies who had had a great shooting match the evening before. The Koreans, who had passed through, were retreating north and had no idea the UN was ahead of them in the town. In the morning we met the CO, Lieutenant Colonel Neilson, returning from a recce they had been on the night before when they too had driven through in their Bren gun Carriers the same troops that we had met in the town. They were also thought to be Russians and very carefully reached the end of the enemy column and then hid themselves until the morning. Riding on tanks, we continued our advance and soon reached Pyongyang where we were one of the first units through, and here we came across a Korean armed convoy that had been blasted apart by the American Air Force. There were vehicles, mobile antiaircraft guns, armed vehicles, tanks and bodies everywhere. The tank we were on was in the lead, and simply pushed aside everything or ran it over, as the order was not to stop. Best not to look at what we and the following tanks had done, especially to the bodies. At Yong-Yu, the American airborne had been dropped three days before and had a big battle. When we entered there were snipers everywhere, so we were ordered to burn the town, which we did very efficiently, but as soon as it was well alight we were told to put it out because the artillery gun limbers could not get through. When you are told to burn down a town it first causes some concern that you should do such a thing, then you wonder how to start it. The houses were mainly made of wood and a match to the ceiling straw had amazing results. We headed for the McArthur Line (named after the Commander in Chief, General McArthur) a point beyond which the UN was not expected to proceed but did. There was to be some considerable fighting and advancing before the Brigade eventually reached Chongju where the advance stopped. The Americans moved through in front and we could clearly see the hills alongside the Yalu River. Ahead lay China's border with North Korea. Within twenty-four hours the Chinese had entered the war. The Brigade was asked to move forward and hold a position while other forces moved back. At one stage the Battalion was some 25 miles in front of all other UN forces. Eventually, the Americans sent us enough tanks to move the whole Battalion out. We travelled south over hard gained ground and saw much evidence of the hasty retreat by the Americans who had left masses of equipment, machine guns, artillery, etc., where it had been sited. This was later captured and turned on the UN forces, along with huge quantities of stores at Pyongyang that had been only partially destroyed. We did not catch up with other UN forces for a long time. It was very demoralizing to keep retreating, but we did. One night was spent across the river south of Seoul before the bridges were blown and the whole town was on fire from end to end. The UN retreated south of the 38th Parallel and then dug in. General Matthew Ridgeway took over command when General Walton Walker was killed in a Jeep crash in December 1950. Ridgeway was made of sterner stuff and ordered all commanders to have plans for advance and not retreat - he later became Supreme Commander of UN Forces when General Douglas MacArthur was relieved of his duties by President Truman in April 1951. We eventually moved forward until we reached Daffodil, 3000 feet up on the 38th Parallel. This was at the height of the winter and we occupied an old American, and later Chinese position, at the top of a long ridge on a hill. I remember bedding down for the night close to what I thought was a pile of logs covered in snow. In the morning I noticed a hand sticking out and rather than logs these were all frozen bodies and there were many piles of them amounting to many hundreds of bodies. Due to the heavy snow and frost we did not know that we were in an American minefield. There were tripwires all over the ground, but fortunately these were held firm by the extreme cold thereby not going off, except for one that did explode when a fire was lit and the ground thawed out - luckily there were no causalities. This alerted us but it was impossible to find the location of the other mines due to the heavy snow and frost. Fires were forbidden, so we had to stay where we were. I climbed up some rocks that were along a footpath we used daily and held onto a branch of a tree to help myself up. It was later found when the thaw set in that another South Korean unit had soldiers killed at this point as there was a wire attached to the tree and a land mine. We had spent days in the middle of this minefield and except for one case had got away with it. The winter arrives very quickly in Korea. One day it is tropical with hot nights, then hot days followed by very cold nights and soon arctic weather with minus 25 to minus 40 degrees plus. We had spent the pre-winter period with frost at night in tropical clothing, a blanket and a waterproof poncho that kept us mildly warm. Luckily for us the Americans produced magnificent winter clothing, though it made marching (not often practised by the Americans) more difficult due to the bulk. British string vests (very warm although a rough garment) worn under British army shirts, draws (woollen long), battle dress trousers and top, American windproof trousers, a superb jacket, fur hat and British outer Arctic gloves - then try a route march. We had American sleeping bags made of a blanket material with a zip that undid immediately in case of attack and this was inside a very good Arctic British sleeping bag. Get snuggled down in that and then 18" of snow in two hours on top, while we slept with all our clothes and boots on - one was very warm until someone came trudging along and stepped on you to call you for the next two hours on sentry duty. Getting up entailed a mound of snow going down your neck and into the sleeping bag. Two hours off, desperate for sleep, but difficult to sleep because you only had two hours - two on and two off, or two on and four off depending on the seriousness of the situation was an extremely exhausting but quite normal life. There were a number of occasions when we had to route march for many miles because transport did not appear for some reason or other. On one occasion in the dark and snow we walked and walked, climbed a steep, high hill with enemy all around in the deep snow. We were told that we were cut off, and had to climb down back the way we had come. We passed, in both directions, a broken down Bren gun carrier that had thrown a track which, had they known, would have had plenty of time to get repaired. Eventually we arrived to see a huge bonfire lit to guide us back to where transport was waiting across a solid frozen river - tanks and troops were able to cross in the dead of night. We were so crowded in the trucks that you could sleep standing up. Someone dropped a Sten gun that fired, but luckily no one was hurt. If a hand touched metal it immediately stuck to it causing a large loss of skin. Snow, when it did snow, fell with abandon, some 18" to 24" in a couple of hours. When you were on for two hours and looked round you could see no one and had to walk until you trod on someone to get your replacement for the next shift. We were full of lice. On one occasion, in extreme cold, we had to take off all our clothes in the open and wash from hot water heated in a forty-five gallon barrel laced with the Medical Officer's disinfectant and heated over a fire - we then put on clean clothes. The old clothes, on a stick, were taken to the First Aid post and put in disinfectant laced 45 gallon barrels to be deloused. What a relief to be free of the lice, but this did not happen very often so you just scratched and picked. We became used to American 'C' rations the top two items of which were fruit salad and a huge bar of the very best, at least as far as I was concerned, drinking chocolate. With these came twenty American cigarettes a day - Lucky Strike, Chesterfields, Camel (humpty backs) plus another two hundred every Friday from the American PX (equivalent to the British NAAFI), i.e. 340 cigarettes per week per man. If we had smoked all these it could have been more dangerous than the enemy, instead we used them to bribe the local peasants to carry heavy loads up the hills on their A frames. Tapeworms were another jolly little hazard and our MO laced the tea with his various concoctions that were very effective. It was very alarming passing an 18" to 24" tapeworm. Was it your own guts? During the campaign I was lucky enough to get seven days leave in Tokyo in the middle of apple blossom time. I did not go to visit Hiroshima as some did, as I had already done this when I was on HMS Jamaica. Some of this account is not in strictly chronological order but rather it is memories of various events all making up an experience that I would not have missed. At the time you thought, "What the hell am I doing here?" and when you got away with it 'scot-free' you felt it was some experience. I had nightmares for many years after, especially about Hill 282 and other events. It was not all doom and gloom - we had many laughs, great comradeship and on occasions, parties, especially with the New Zealand Maoris making a wicked brew in a bath they had found in a (dry) paddy field. The Argylls left Korea at Inchon in April 1951, on board an American troopship the USS Montrose. HMS Belfast, wearing the Flag of Rear-Admirable Scott-Moncrieff, Commander in Chief of British Naval ships in Korean Waters, was there to see us off. The ship, with all the sailors manning the decks, gave us three cheers and their Chief Engineer, a Scot, stood on a forward 6" gun turret in full Scottish regalia playing 'Highland Laddie', the Argylls March Past, & 'The Campbells are Coming' on the bagpipes - there were not many dry eyes among those tough Scottish soldiers. All this, first in a tropical summer and then very severe winter with temperatures of minus 40 to 50 degrees, we had slept, eaten, washed, shaved and fought in the open in all these conditions.Tanks and lorries had to keep their engines running 24hrs a day, 7 days a week or they would freeze solid causing irreparable damage. Hardly believable now but it was amazing what a human being can put up with when he must. As were many others, I was 21 years old, and some were a lot less. It was wonderful to get back to the warmth of Hong Kong - showers and real beds, which was bliss after sleeping on the ground for all those nine months.